In this article, Creative has finally turned black after 3 losing quarters. What a relief, it was. Now moving forward, Craig mentioned that they are still cutting down on costs, and improving channel and inventory management. There is a good breakthrough with the new X-Fi Aurvana headphone. And there will be a new home entertainment system from SoundWorks named I745. We believed this is quite similar with the CD745 which we already introduced earlier. And in every CES which happens on early January, Creative will always reveal a new innovative product that will surely rock the consumer electronic market. Hope they get the Best Of CES 2008! CREATIVE Technology has much to smile about. After three quarters of being in the red, it posted its first profit of US$1.3 million (S$1.9 million) in the three months ending Sept 30. Looking ahead, the company was in a positive and upbeat mood. After all, said Creative's president and chief operating officer Craig McHugh, it had sold 25 million MP3 players, second only to Apple's 100 million. Quoting a March report from research company IDC, he said Apple's share of the MP3 market stood at 26.4 per cent. Creative's second-place share is small in comparison - just 4.5 per cent. But other rivals are even more of bit players: SanDisk is No.3 with 3.1 per cent and Samsung and iRiver trail with 1.5 per cent and 1.4 per cent, respectively. Apple aside, Craig, who was in Singapore for the release of the results, pointed out that no other company, including rivals like iRiver, SanDisk and Samsung, has Creative's technology, style and reach. Its technology comes from the Singapore firm's core expertise in audio, which it developed and copyrighted while building the sound card, its first product which catapulted the company to success in the early 90s. To stay ahead, Creative's twin strategy was to lower component costs plus shed headcount in Europe and the United States. It also sold off a factory in Malaysia. Additionally, it moved the majority of its MP3 players from hard disk to flash memory, a strategy which has paid off. With prices of flash memory falling as much as 33 per cent in recent months according to research firms, Creative was able to sell digital music players that are cheaper than hard-disk ones and yet earn a good profit margin. All eyes are now on the upcoming holiday season, traditionally the best selling period of the year for any consumer electronics vendor, including Creative. It has two interesting products in the market: A credit-card-sized music player and a high-end noise canceling headphone, branded Aurvana. Reviewers have given the Aurvana (combination of audio and nirvana) the thumbs up, said Craig. 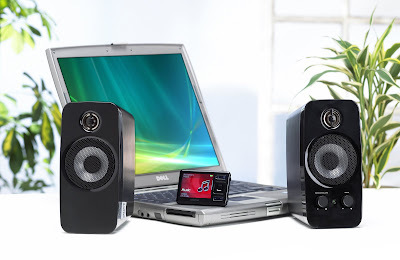 In fact, its standing is better than higher-priced, more established brands like Bose. Creative was able to leverage on its sound technology, which it was able to use to make compressed MP3 audio, which otherwise sounds thin, come out full and rich instead. In the United States, it will have a third product ready for the holiday season: A new home entertainment system! from its Cambridge Soundworks subsidiary. The 1765, which incorporates a radio, iPod dock and video-in and video-out, is a lower-priced system than its more expensive sister products in Cambridge. Unfortunately, this product will only come to Asia next year. More treats have been promised in January, when the company lifts the veil on new entertainment products at the annual Consumer Electronic Show in Las Vegas in early January.